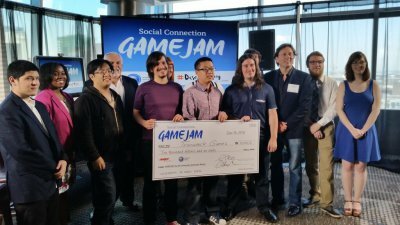 Trainwreck takes the grand prize in AARP Social Game Jam @ E3! We are a team of students from the UC Santa Cruz Masters in Games and Playable media program. We're being helped by talented artists from SJSU and AAU to make the action brawling sport game Ulama: Arena of the Gods! Ulama has been Greenlit on Steam! WE'VE BEEN GREENLIT! On Wednesday this week, we got the official notification that Ulama: Arena of the Gods has been Greenlit by the Steam Community to be released on that platform. We're very excited by this next step and would like to thank everyone who helped us by voting on the project and spreading the word! We'll be keeping you updated on our progress to release. Ulama nominated for Visual Art prize in Sammy Awards 2016!